You are here: Home / Healthcare opportunities / Healthcare costs / Who pays for US healthcare? But as I have been watching various healthcare experiments unfold, and innovations emerge, I keep seeing promising ideas and ventures for which at some limited levels patients do seem to be paying. And for a variety of reasons, about which I will write another time, I am starting to wonder if the most promising changes to our healthcare system are going to emerge outside the traditional ecosystem (as Clayton Christensen suggests they may do), and in particular outside the traditional funding ecosystem. With that in mind, I decided I wanted to get clear in my mind just who pays for US healthcare today. Below are a few of the interesting things I learned, that I think may be relevant in thinking about future opportunities. Digging again into the National Healthcare Expenditures, and the subset thereof called “Personal Healthcare Expenditures” which is the relevant portion for this discussion, you see immediately that the vast majority of the $2.2 Trillion we spend on this bucket of healthcare is paid for by insurance or other third parties, with only 14% being paid out of the pockets of individuals in 2010 (see graph above). Now, bear in mind that 14% of $2.2 Trillion is still a big number ($300 Billion!). And of course, we also pay insurance premiums etc. 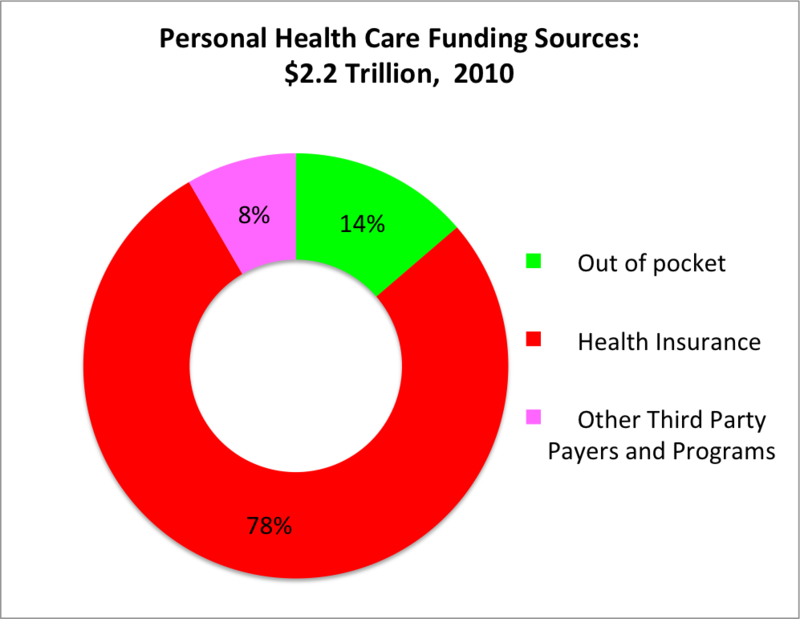 But, from the point of view of the providers of healthcare, 86% of their money comes from someone other than the patient. This has all the obvious implications in terms of incentives to control costs, and in terms of who the customer really is, and these have been written about extensively. And overall, this situation has been getting more and more pronounced over the years. The green “out of pocket” component has been declining steadily from 50+% in the 60’s to today’s low of 14%. Picking up the slack have been private insurance, and the CMS programs (Medicare, Medicaid and CHIP). 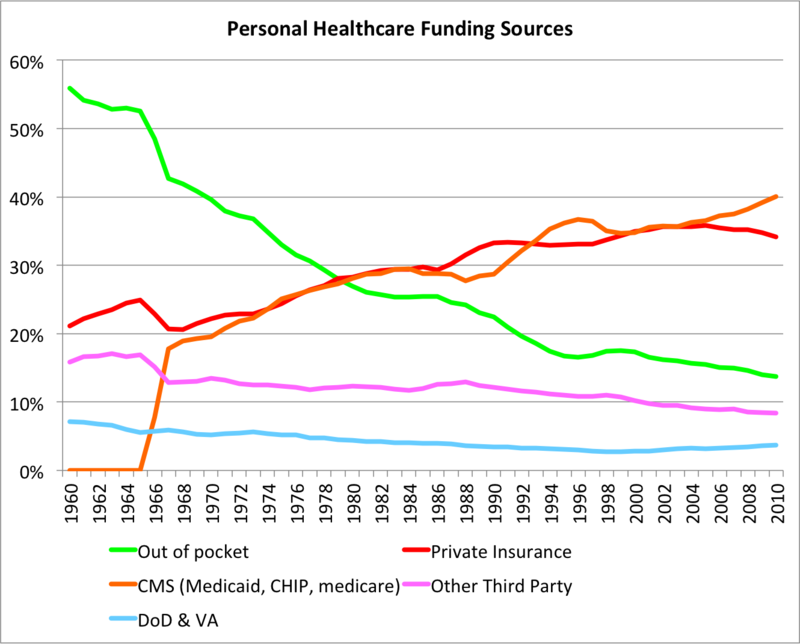 When you drill down a bit deeper, what you find is that the portion paid by patients out-of-pocket varies quite a bit across the differing “buckets” of healthcare expenditures. For example, in the two categories of durable and non-durable medical products*, patients pay out-of-pocket fractions of 50+% and 90+% respectively! Prescription drugs (19% out of pocket). At first glance, the picture below tells the story of a healthcare system with trivial portions paid for by patients out-of-pocket. 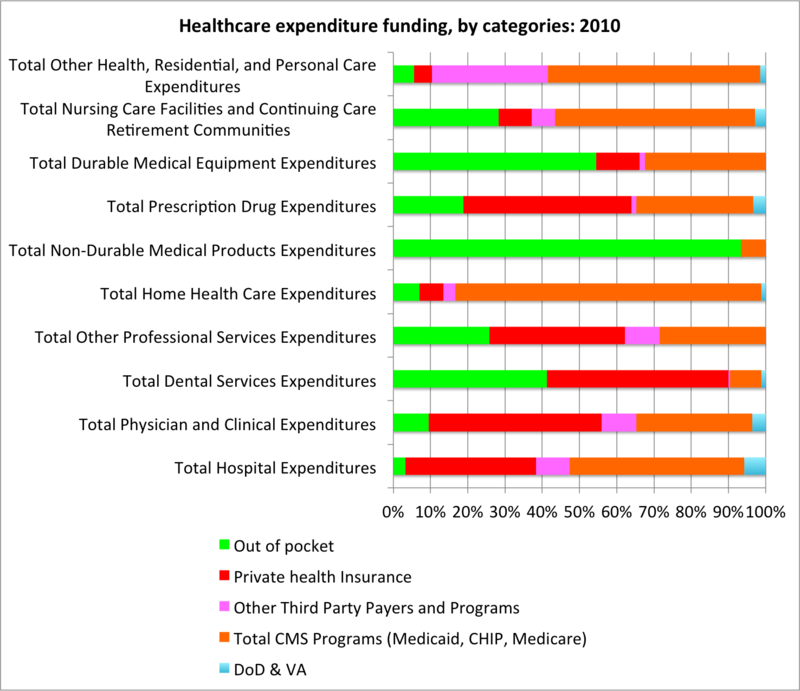 And it’s tempting to focus on the big categories: hospitals, physicians, and drugs. [Yes, that is $800 Billion per year we spend on hospitals]. When do patients become the “customers”? Using the definition that the “customer” is the person paying for the service, then the pronounced and steady decline of out-of-pocket payments over time suggests that patients are less the customer than they ever have been before. But I think the situation is more nuanced than this. A decade ago, the typical private insurance plan would have a pretty low deductible and some modest copays. When you went to the doctor, you might occasionally pay most of the bill (early in the year when the deductible was not met). But mostly you just paid a small percentage. So for each visit, it was really the insurance company that was the “customer”. With the rise of high-deductible insurance plans, a different situation has emerged for the subset of the population that uses these plans. In my case, for example, I never reach my deductible. My insurance is there for emergencies. So, in reality, when I visit the doctor, I am mostly responsible for 100% of the bill. This suddenly focuses one’s attention on topics like value for money and customer service. For the types of healthcare encounter, such as primary care, for which the high-deductible insured are likely to pay all of the costs, the patient really is “the customer“. The rise of concierge medicine seems to me in part a response to the empowerment of this new class of medical “customer”. And so in the healthcare bucket of physician expenses, there are now multiple subsegments. There are still large numbers of individuals, covered by insurance designed as a prepayment plan, with relatively low deductibles. These patients expect “insurance to pay for things”. They are not truly the customers. There are those newly empowered consumers, in charge of their own first $10,000 or so of expenses, who do pay for things now. These individuals are customers, and one could imagine success might attend any new venture that targeted this audience and offered higher customer satisfaction than the traditional healthcare system offers today. And then there is a third category, exampled by aesthetic medicine, in which patients seem happy to pay for certain categories of things themselves (facelifts, dermatological procedures, LASIK, etc). As I have mentioned in an earlier post, there is a very vibrant segment of the healthcare ecosystem that targets these customers, and which is designed to be far more patient (customer) friendly than conventional healthcare. The Skilled Nursing category is particularly interesting in this context. The numbers show that out of pocket expenses in this category cover 28% of the overall costs. But if you dissect this further (food for another post), you find that there are distinct sub-segments within this segment too. Consider the geriatric-care type of nursing home. Most people do not have insurance that covers this type of nursing home. And Medicare does not cover it. So, for those insufficiently impoverished to be on Medicaid, the full cost of the nursing home stay is their responsibility. These people are very definitely the customers. And there is a well defined segment of the aged-care nursing home universe that is very focused on serving the needs of these customers. In contrast to the above, Hospital-based procedures stand out as poster children for the school of thought that patients don’t pay. 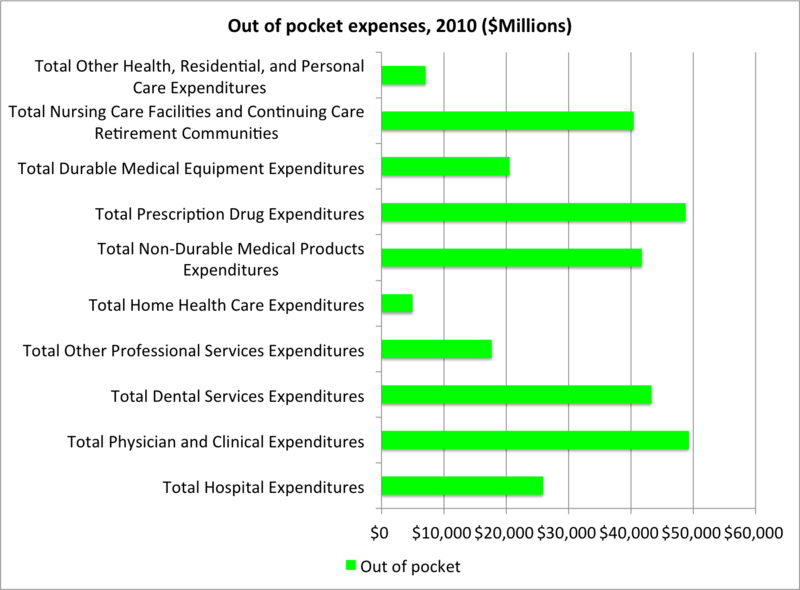 The overall fraction of hospital costs paid by patients out-of-pocket is very low (3%). And typical procedure charges are high, and thus generally exceed the deductibles of even high-deductible insurance plans. So, in most scenarios it is some third party which pays the lion’s share of a hospital’s bill, and thus plays the role of primary “customer”. Today, quite a lot of money is controlled by patients themselves ($300 Billion). In scenarios where this money is smeared across multiple healthcare encounters as small copays, it seems to me we can continue to think as before that “patients don’t pay”. There are today quite substantial segments in which patients do pay the majority of the costs for specific encounters. It seems reasonable to think that the healthcare system might adjust (in time) to treat them more like customers than in the past. There are robust examples of this in aesthetic medicine; concierge primary care; and private-pay, skilled nursing facilities for long-term, geriatric care. How one thinks about each of these segments depends very much on the exact details of an individual’s insurance/prepayment arrangements. This is exactly the sort of detail that may change significantly, depending on which political faction sets the direction for the future of healthcare in America. So placing bets on innovations that require patients to pay, entails substantial political risk. * Durable medical products are things like contact lenses and eyeglasses, orthopedic products, oxygen and hearing aids. Non-durable medical products are things like Over The Counter (non-prescription) drugs, needles, thermometers etc. Thanks ever so much for your excellent work on the many details of the Healthcare conundrum. You have saved me an immense amount of time, from digging out the details to analyzing and presenting them in an understandable format, as well. Great work!!! Right on point. Very understandable graphs. 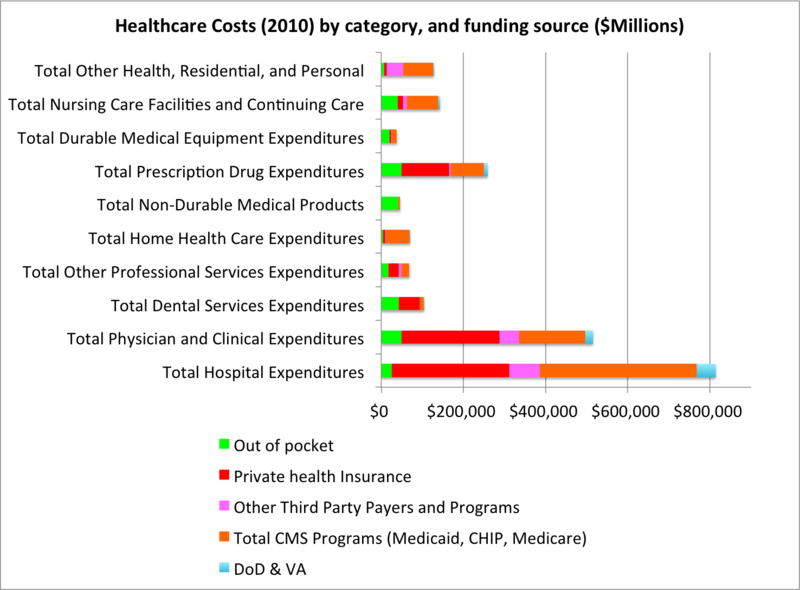 Your analysis unravels a lot of the mysteries of the health care cost financials. Where do things like molecular diagnostics fit into these tables/charts Richard? I think it depends on what type of test and where it is administered. For lab tests taken at a doctors office, or afterwards at the suggestion the clinician, I believe lab tests would be captured under Prof Services: Physician and other clinical services. So if the molecular diagnostic was a lab test type of measurement, this would be where lots of the costs would go. However, tests administered in a hospital may well show up under “hospitals”, and if the tests were available as over the counter products in a pharmacy (no prescription) they may show up as nondurable medical equipment. The document that explains exactly what goes where in these national accounts does not call out molecular diagnostics specifically.